As December winds to a close, many Canadians will be heading out to their local dealerships to take advantage of the exciting seasonal sales. If you want to make sure you get the most out of your holiday car shopping this year, make sure to check out Yorkdale Dufferin Mazda’s certified pre-owned Mazdas. Certified pre-owned vehicles are some of the most reliable on the road, and at Yorkdale Dufferin we are proud to offer a variety of Mazdas from recent years that are in excellent shape and have low kilometers. If you are considering a new-to-you vehicle this Christmas, here are four reasons to make it a certified pre-owned Mazda from Yorkdale Dufferin. If you are shopping for a new car, you want to be sure that you have options. This is why you should make Yorkdale Dufferin your first Mazda Toronto stop: we have an incredible range of best-selling certified pre-owned Mazda cars and SUVs, and whether you are looking for a 2015 Mazda CX-5 with a sunroof and a remote starter, or our world-famous 2016 Mazda Miata roadster with leather seats in premium condition, Yorkdale Dufferin has you covered. One of the main reasons why shoppers opt for certified pre-owned vehicles is because they provide a perfect balance of quality and affordability. Only the best used Mazda will pass the certification process, which involves an 160-point inspection that covers every aspect of the vehicle’s functionality, so when you buy certified pre-owned you know you are getting a quality vehicle. At the same time, a certified pre-owned vehicle sells for significantly less than a brand-new one, which means you can get a good-as-new vehicle at used vehicle prices. 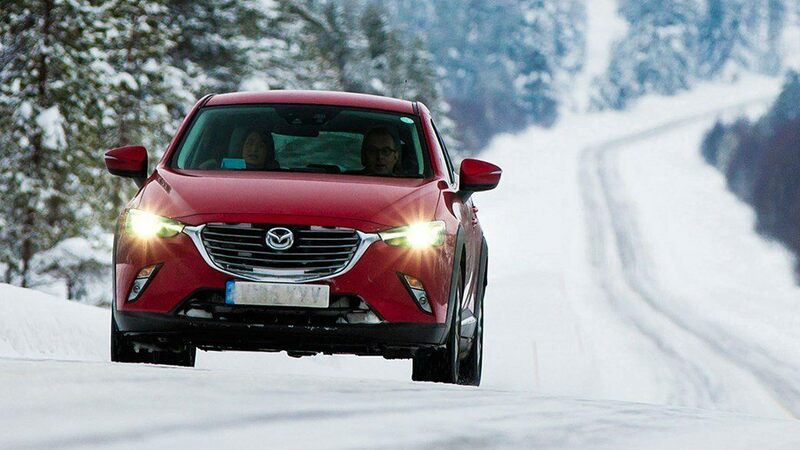 Whether you want a sleek sports car to keep the winter blues at bay or a powerful, rugged SUV that can make it through even the worst winter storms, a certified pre-owned Mazda is the way to go. While the inspection guarantees that a certified pre owned Mazda is in excellent working condition, the generous warranty that is available on all certified pre-owned Mazdas from Yorkdale Dufferin Mazda ensures that it will stay that way. We currently offer a 7-year/140,000 km limited powertrain warranty, and a 30-Day/3,000 km exchange privilege. If your vehicle shows signs of wear, or if you aren’t happy with it immediately after purchase, we will ensure that it receives the repairs it needs or provide a suitable exchange. 4. Support you can Rely On. All Canadian drivers know that when navigating icy winter roads, anything can happen. Even the safest and most cautious drivers will sometimes find themselves in situations where they need some support, and the last thing you want to do is venture out with a plan for what happens in case bad road conditions land you in the ditch. This is why certified pre-owned Mazdas from Yorkdale Dufferin come with 24-hour emergency roadside assistance, so you always have someone to call if you get into an accident. One of the benefits of buying a vehicle in December is that you get to see right away how it handles the worst weather a Canadian winter throws at it. If you don’t want to take any chances on your safety or comfort but you also want to save money on your next vehicle, visit Yorkdale Dufferin Mazda today and see which of our certified pre-owned vehicles is right for you!